In a world dominated by print, images and videos, imagine not being able to access content vital for your day-to-day functioning: weather updates, homework assignments, timetables… This is the reality for an estimated 285 million people worldwide who are visually impaired. Accessible content is even harder to come by if you belong to the 90% of print impaired individuals who come from low-income settings. Enter Benetech. The U.S based organisation isn’t your run of the mill tech company. It’s a nonprofit whose mission is to empower communities in need by creating scalable technology solutions. Their work is varied: from providing a safe space for human rights defenders in over fifty countries to document human rights violations to equipping environmental conservationists to protect ecosystems and species all over the world. One of Benetech’s projects is Bookshare: and it’s transforming how over 400,000 people with disabilities read. Bookshare is the world’s largest online library of accessible ebooks for people with print disabilities. A print-disabled person is "a person who cannot effectively read print because of a visual, physical, perceptual, developmental, cognitive, or learning disability". Through its extensive collection of educational and popular titles, specialized book formats, and reading tools, Bookshare offers individuals who cannot read standard print materials the same ease of access that people without disabilities enjoy. The Bookshare library now has over 475,000 books and serves more than 400,000 members. BookShare works in 70 countries across the globe, with India having particular focus, as it has the largest number of persons with disability in the world. With outreach in all states, they are providing accessibly content in English, Hindi, Tamil, Telugu, Gujarati and Marathi with plans to add Kannada to their offering. BookShare is sourcing its multilingual content for children from StoryWeaver. Since all content on the digital repository of multilingual children’s stories is openly sourced and available in open formats, BookShare has been able to take ePubs from the platform and convert them to the DAISY Format. DAISY (the Digital Accessible Information System) is the emerging world standard for digital talking books for people who are blind or have a print disabilities. This format has been under development for over ten years, with most of the world's talking book libraries now employing the standard in some form or the other. “Our strategy is to empower individual organizations so that they can reach out to many more on our behalf. This leads to a multiplier effect, which can be difficult to monitor in a country as vast as India. However, if our membership numbers give the indication that we are moving in the right direction.” shared Dr. Mobedji. Bookshare’s outreach work brings them into close proximity with schools, colleges and institutions working with the print disabled. They have more than 7500 members in the country, and approximately 500 new members every month. 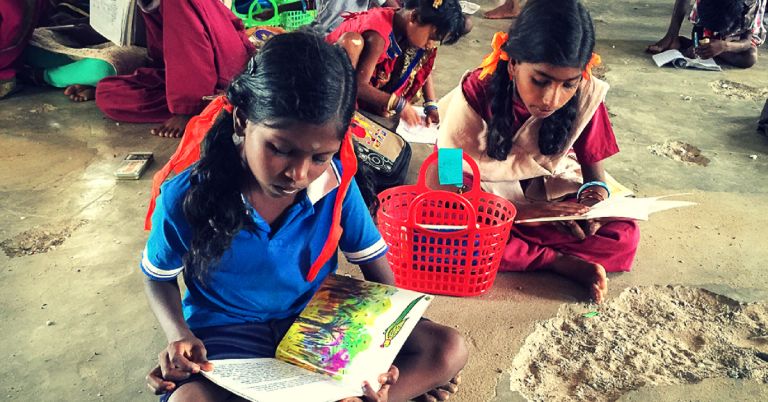 The nonprofit’s main focus in India is to create textbooks and children’s books, as these are both in high demand. The organisation has already shared the syllabus from a number of states including Maharashtra, Himachal Pradesh, NCERT and IGNOU. 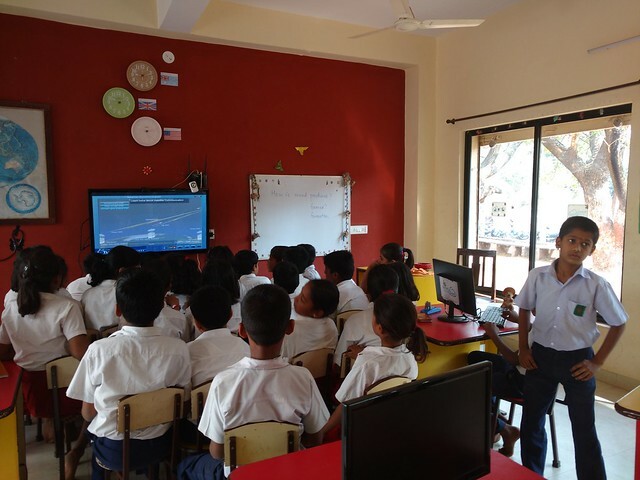 Bookshare is working directly with a selection of schools in Pune, where a curated list of Marathi titles have been chosen from StoryWeaver as part of the All Children Reading Project which promotes early grade reading with the help of technology. “The stories were loved by our children of 2nd, 3rd and 4th grade, who can now almost recite all the stories by heart. 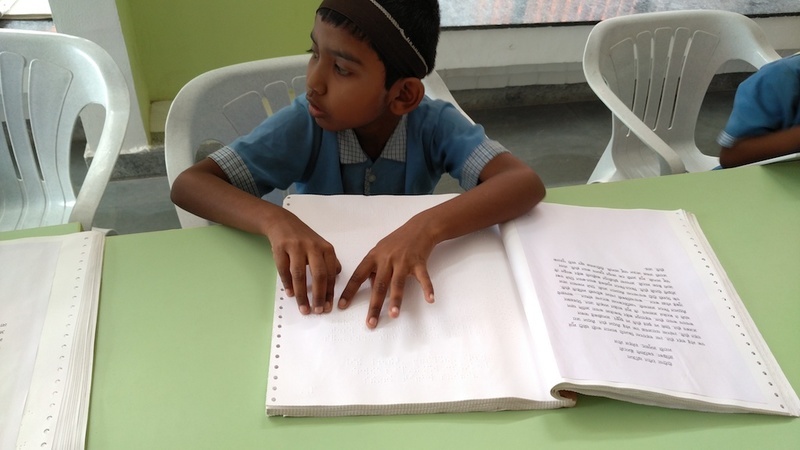 The teachers have observed that as the children loved the stories, they accepted braille reading, which was difficult when the children were only given textbooks to read. Some of the children have improved their braille reading tremendously, which is a major achievement.” Dr. Mobedji recounted. By openly licensing all the content on StoryWeaver and making them accessible in open format, we are proud to be associated with Bookshare and their efforts to take reading to ALL children. “Communities Rising was struggling to find affordably-priced, beginner reader books in English and Tamil that the children would enjoy reading,” shares Betsy. This is a common problem faced by organisations working in education and literacy at the grassroots level: not enough books, in not enough languages, compounded by poor access and issues of affordability. Most publishers cater to middle and upper income audiences in urban areas, often to the detriment of creating joyful books for underserved communities of children. StoryWeaver’s relationship with Communities Rising started earlier this year, when they attended a workshop and demonstration in Bangalore. Via the platform, Betsy and her team have access to a wealth of books in both English and Tamil, which they can download quickly and print to share with children. A choice of titles in a variety of genres, including books on STEM subjects, are available across reading levels to suit the needs of all students. Communities Rising has downloaded 100 stories in English and Tamil, and is in the process of printing one set of all titles and distributing the same to each of its centres, thus reaching 360-400 students. Printing is often expensive and another roadblock so, Communities Rising experimented with a number of formats before narrowing down on one that worked best for them. “We tried printing the books in two formats. One with single pages hole-punched and attached with rings, and the second with the pages stapled in the center. Durability is an issue so we printed samples on heavy, cardstock,” shares Betsy. The organisation believes that reading makes children learners for life, and encourages reading in a big way in their after-school programme. They have just opened their first community library in an area where there there are no other such spaces. The organisation is running two other initiatives to great success. One is the ‘Daily 5,’ a reading programme developed by educators in the US; and the other is ‘CR Super Readers,’ a homegrown reading incentive programme. Both programmes are working wonders! Students are first taught how to pick ‘Good Fit Books’ that they can read comfortably. The books are then kept in a book basket which they share with a friend. Each day the students have to read to themselves for 5 to 10 minutes. Other days they have to read to their partner. In this way they can help and learn from each other. Students keep a list of all the books they read and have it checked by a teacher for comprehension. This forms the basis of the ‘Super Reader’ program. “I’m happy to say that we are giving out many pencils,” says Betsy, who believes that the necklaces, reading pencils and Super Reader pins help build a sense of community and sense of belonging to Communities Rising, amongst the children. “At the end of the year, the top readers from each center will travel to Chennai to visit Tara Books for a program there and the top reading center will have a book party!” she says. “All of our students are now reading everyday; story books, non-fiction books, biographies, all kinds of books. They are discovering the joy of reading! Without StoryWeaver, this remarkable change in our students’ reading habits would not have been possible,” shares Betsy. “Last year, I told some of our kids, that I was looking forward to hearing complaints from their parents that they were spending too much time reading, instead of playing or helping at home. We aren’t quite there yet, but with access to so many stories now, I have no doubt those complaints aren’t far away,” says Betsy. We look forward to hearing those complaints too!